Author's Note: This travel narrative describes experiences during a trip to Havana in December, 2006. It does not attempt to provide a comprehensive account of contemporary gay life in Cuba. Nor does it offer comment on broader social and political factors that shape life in Cuba. In 2008, the government of Raul Castro has shown quiet, tentative signs of increasing tolerance of gays and lesbians. The DJ turns the music up. A mix of Latin rhythms and techno beats punches through the night sky towards the stars. The crowd grinds closer together, hips sliding as though on swivels, arms stretching into the air. Faces flash. Eyes lock for an instant before the surge of movement interrupts. The bottles of rum are nearly empty and the fiesta accelerates with abandon. Four drag queens lounge in the shadows chattering through an ember glow and cigarette haze about the spectacular show they put on earlier. Each performed three songs, lip-syncing lyrics of love betrayed, defiant femininity and outrageous kitsch. Each paraded three dazzling outfits, from skin-tight body suits to strapless dresses held up only by cleavage. Gold-sequined shoes made it look as though one drag queen strutted on a pedestal of sparks as she worked the catwalk. The audience gasped as another appeared in a bikini and stiletto heels, leapt into the air and landed in the splits. Admirers approached the stage and paid their devotion by stuffing Peso notes between skin and fabric. Tonight's fiesta is hidden in an old farmhouse's courtyard on the fringes of Havana. A cool night breeze weaves between the dancing bodies. In a quiet shadow of the courtyard's stone wall a pair entwines with fumbling urgency. The world beyond the wall has vanished and only the sky looks on. Unpolluted by the distant lights of Havana, the three-starred belt of Orion, the silent hunter, burns bright as he stalks his arc of sky. It would have been impossible to find the fiesta without the help of my host in Havana. I will call him José to protect his identity. Around midnight he took me to the edge of Vedado, a lively district west of central Havana where crumbling art deco facades line the streets. We waited on 23 Street next to the Yara, a 1950s cinema. Young, blinking couples emerged from the theater and plotted their next move into the Havana night below the cool glow of the hundreds of energy-saving light bulbs studding the Yara's awning. Hesitant, tentative tourists from the nearby Habana Libre Hotel explored cautiously. A steady stream of people emerged from the Copelia ice cream parlor, a 50s-style complex of cast concrete with legs that arch like a spider's and support a central torso of circular pods with seating and stations for serving. Classic cars and old Soviet Ladas clattered up 23, trailing ribbons of black exhaust. The rhythms of salsa music, infectious with muted joy, pulsed from nearby clubs. We leaned on a stone embankment next to the sidewalk, waiting. José is in his late 40s with flashes of grey in his short, dark hair. His eyes are full of life but weary with the street smarts that it takes to get ahead in Havana. He was watchful as we waited, gauging those passing and those milling around. José hissed and nodded at a teenager with long, sandy blond hair from a bottle who walked up and down the sidewalk and then rested against a tree. The boy's wrists were wrapped in leather straps and bracelets. He turned to José, nodded and took a step closer. José returned to my side and explained that we needed to wait until we found enough people to fill a car. It would be cheaper that way. The four cars parked on our side of 23 Street were all unmarked taxis. The drivers were friendly to the idea of the fiesta and, most importantly, knew the location. José explained that the fiesta regularly changed locations to reduce the threat of problems. As we spoke, a rat emerged from the tangled shrubs on the embankment, shimmied along the top of the stone wall, cast itself to the sidewalk three feet below and waddled into a hole. "Do the police cause problems for gay people?" I asked. "No," José replied. "Gay people cause problems for gay people." Gay life in Cuba is filled with such cryptic, contradictory messages. I had reserved a gay-friendly casa particular, a rented room in a private home. The only clue that it was gay-friendly was a discreetly placed rainbow flag atop a dresser in a photograph of the room that the renter emailed me. It turned out the room was occupied for the days I needed but the renter suggested José's casa as an alternative. He confirmed that José "thinks exactly like me about the life." Nothing was said about gay life, but on my first night in Havana, José took me to a cafe halfway down La Rampa, the slope of 23 Street between the Yara and the seafront. A group of a dozen young men had pushed tables together and sat gossiping and giggling. Two of them kissed. Some rolled-up their t-shirts to show their midriffs. Others wore over-sized belt buckles and low-riding jeans. "What kind of bar is this?" I asked José. "What reputation does it have?" "It attracts people who like different things," he said. "People from the other side." Later I would learn that police had raided this bar a few nights before I arrived. The raid began with several undercover officers filtering among the tables discretely listening to conversations. Then uniformed officers burst in and checked everyone's identity papers. Some were detained for not having permission to be in Havana. Others were detained for having contact with foreigners, which is forbidden. José was at the bar when it was raided but was not hauled away by the police. He did not tell this story when I asked if the police caused problems for gay people, I heard it only later from one of his friends. Though it is not illegal to be gay in Cuba, systematic police harassment seems designed to make it uncomfortable. However, systematic police harassment seems to make nearly all young people uncomfortable. "We can't even walk into the tourist hotels," one young straight man explained. "We might see a different country that way. You can walk right in, but they would stop me. Two million people in Havana and one million policemen," he said shaking his head, disgusted but resigned. The inconspicuous loitering at the Yara, the subtle language of identifying one another, the glances, the hissing, the whispering, and fiesta's location known only by the drivers of the unmarked taxis were all part of slipping away from the watchful eye of the police. José eventually discovered two more who wished to go to the fiesta. We piled into a bright blue 1956 Dodge, the engine clattered to life and we escaped. The driver turned the Cuban music up and cranked his window down. Buffeted by cool night air we sped through nearly empty streets, the stoplights turning green upon our approach. Our unknown destination pulled us past leaning palm trees, past the lighthouse-like memorial to national hero José Martí, past figures edging along the street lugging jugs of water, past cast-concrete bus stops where people seemed to congregate not for transport but for companionship, then factories and sugar cane fields as Havana receded into darkness behind us. The lights grew sparser, the roads narrower. Had there been anything to say, the wind and music would have swept the words away. We sped along for perhaps 20 minutes before the driver slammed on the brakes and snapped off the headlights. Buried in night, we swerved from the paved road and up a steep, dirt driveway. The driver flashed his headlights, revealing for an instant a sheet-metal gate. A pair of young men peered out and then swung the gate open. We slipped through without stopping and the gate clanged shut behind us. The heavy old Dodge stumbled to a stop next to a high stone wall, the engine expired with a rattle and wheeze and the night was suddenly silent and still. José had been here before and knew that the battered sheet of metal against the stone wall was a door. He pulled it open, revealing an arched passageway through the wall. The only suggestion of a fiesta was a rainbow lamp the size of a tennis ball nestled in the apex of the arch, casting tiny splashes of color on the stonework. The passageway opened into a narrow room where a votive candle flickered and set shadows dancing across the crude stone walls. We passed through the room and another lifeless one like it before the relief of entering a vast courtyard buzzing with life. We'd found the fiesta. The organizers were still preparing for the drag show, testing the lighting and sound. In the center of the courtyard a gazebo had been decorated with strips of cloth and strings of lights. This stage was augmented by a catwalk created by covering a row of tables with a swath of threadbare carpet. A bed sheet draped from an overhead wire gave the powdering and preening drag queens the suggestion of a backstage area. We took a seat at the tables clustered around the stage. The chairs were crafted from welded re-bar and sheet metal, all painted deep green. The rum was served by the bottle, mixed with sparkling lemonade and drunk from plastic cups. At last, to a swell of music and the cheers of the 150 or so patrons, the night's hostess took the stage in a flowing dress and burst into a breathless number. The subtle language used to discover one another, the looming threat of the police, the unmarked taxis, the metal gates and stone walls, the quiet brooding of Havana, all seemed to vanish in the joy and defiance of the drag show. The production had a simple, homemade feel but could only have been the result of an astonishing amount of work and dedication. Cuba is a country where "disposable" lighters are refilled, re-flinted and repaired by craftsmen in the streets. The camouflage t-shirt José has worn to the fiesta cost him the equivalent of what most Cubans earn in two weeks. One can only imagine the clandestine connections and sacrifices necessary to get one's hands on chiffon or sequins or makeup or high-heel shoes sturdy enough for a man's feet. The drag queens pulled glamour from the rubble, uncovered the chic among the shabby and brought life to the living. They worked the crowd into a glow. With the show over the stars become us as we dance in the tiny space we've found between the courtyard walls, the ground below and the night above. We are the Seven Sisters burning blue. Orion, our pursuer, draws no nearer. The rum tingles through our fingertips. The beauty blinds. A young man slips in front of me, moving soft and supple. "I will teach you to dance," he says. "If you want to learn, you have to watch. Watch me. Watch me," he half whispers, his eyes half closed. His body pulses to the music but his sleepy eyes remain steady on mine. "Do you understand? Watch me." A mustache is just beginning to suggest itself in a downy haze on his upper lip. He lifts his shirt as though by accident, flashing a swath of tight flesh and a narrow trail of hair from belly button to belt buckle. José tells me that most of the young men here "estan en la lucha." Literally "they are in the fight." They sell themselves. The young man trying to teach me to dance is a fighter. "How old are you," I ask, seeing now a melancholy beneath his hypnotic movements. "Eighteen," he says. "But I have experience." Invisible in the night sky above us as we dance are dark stars, stars so dense their light cannot escape their gravity. The fighter is a dark star. Fighting like light the gravity of fate. Sometime after 4 in the morning José and I return to Havana and join several hundred other late-night loiterers along the Malecón, a walkway where the city meets the sea. It is a relaxed, informal gathering with people sitting along the sea wall, waves crushing into rock behind their backs. Others walk up and down the sidewalk to see and be seen. Along this stretch of the Malecón, at the base of 23 Street, most of the people are young and gay. They fill the air with joy and laughter and music and gossip and flirting and friendship. A crowd encircles a rickshaw equipped with a battery-operated radio playing irresistible Cuban music. The crowd dances in the open air and spills into the street forcing cars to honk and swerve. The drag queens from the fiesta make an appearance, attended by small entourages as they strut up and down the street. Fighters, some looking as though they are in their early teens, lean into the traffic and press their hips towards passing cars in hopes of luring a customer. A pair of policemen watches discretely from the other side of the street and occasionally walks along the sidewalk, but they do nothing to disperse the crowd. I ask one young man, a 23-year-old fighter, why the fiesta must be so hidden while the nightly party at the Malecón is so open and obvious. "You're here as a tourist," he says. "You don't know what it's really like." The fiesta, 23 Street and the Malecón are only one facet of gay life in Havana, and he's right, I cannot know what it is really like. Dawn will soon enlighten Havana. The night's stars will fade out. Orion will vanish and abandon his quarry. The Seven Sisters will dissolve. The drag queens will wash away their makeup and stow their sequins. The fighters will retreat to repose in shadows. We will become invisible once again. But for now, shrouded in the failing night, our secrets are safe. For now we dance. Copyright 2008, Eron Witzel. © This work is protected under the U.S. copyright laws. It may not be reproduced, reprinted, reused, or altered without the expressed written permission of the author. 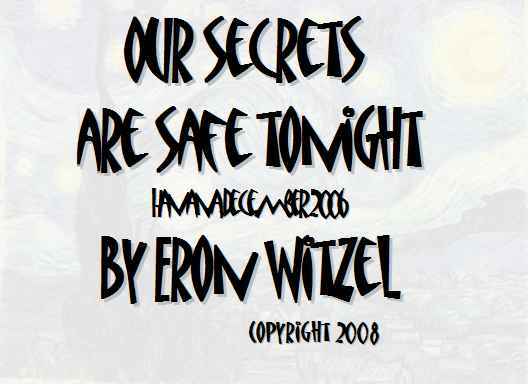 Eron Witzel is a freelance writer and editor based in Berlin, Germany. He holds a degree in journalism from the University of Oregon and an MFA in Creative Non-Fiction from Goucher College. His book chronicling a series of journeys along the remnants of the Iron Curtain can be downloaded here.